Attendees confirmed from across the British Isles including AoC, exam boards, city and county councils, universities, colleges, unions and other organisations such as the WEA and Reading Agency, as well as practitioners and researchers. Teachers of adult English/ Literacy and Maths/ Numeracy have been grappling with the introduction of new teacher education qualifications, changes from Skills for Life and Key Skills to Functional Skills, the development of a unit based curriculum and the pilots to measure distance travelled. Many practitioners recognise the need to reflect critically on the implications of these changes, as well as broader issues raised by current policy and research across the UK. This conference will encourage dialogue between practitioners, leading academic researchers and policy makers in order to explore the best ways of making the curriculum and accreditation work responsively for learners. Learning benefits individuals, the economy and society as a whole. Those who participate in learning are likely to be healthier, happier and better paid than those who do not. This conference will explore English/ Literacy and Maths/ Numeracy as both individual and collective resources. Keynote presentations and workshops will examine what policies and teaching approaches best enable adults to become confident at using and enjoying English/ Literacy and Maths/ Numeracy in their families, communities and workplaces. The conference themes will be addressed through presentations by a panel debate, the keynote speakers and the conference workshops. – Jim Crowther, Senior Lecturer in Community Education, University of Edinburgh. – Karen Evans, Professor of Education (Lifelong Learning) Institute of Education, University of London. Professor Karen Evans, Professor of Education (Lifelong Learning), Institute of Education, University of London. Jim Crowther, Senior Lecturer in Community Education, University of Edinburgh. This workshop is designed for English/literacy practitioners and curriculum managers to introduce a range of interactive learning technologies, devices and resources to support the teaching, learning and assessment of English/ Literacies. Participants are encouraged to bring their own mobile devices in order to interact with online session resources. 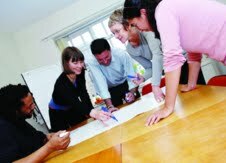 The workshop will include presentation, discussion, online activities and action planning. 1.2. An interactive method for helping learners understand how sentences are structured. The topic of the workshop is the ‘Buddenbuk’ card games, and how this approach helps learners to understand and discuss sentence structure. By playing the games the participants will progress through: making sentences; conjunctions; prepositional phrases; noun phrases; verb phrases. There will be a handout linking these to functional skills, and notes explaining the grammatical basis of the games. The workshop will consist of a short interactive presentation on the National Numeracy Challenge Pilot followed by group discussions where participants will be able to share their ideas and experience. This session will demonstrate interactively the Challenge materials, share some of the pilot findings and discuss ways in which the Challenge can both increase confidence and lead to actual improvement in everyday maths skills and understanding. This workshop will explore the new online materials available to help adults get better at maths, manage money and help their children with maths. Using video and interactive activities and quizzes, the courses can be accessed independently or in a supported environment. The workshop will explore the ethos underpinning the resources and highlight how they can be used to support adult learners. – give details of my research into adult literacy learners’ attitudes to online reading, and the skills, strategies and practices they employ to read websites. I have developed an online portal for the development of learning and teaching where the roles of teacher and learner are open to anyone. The workshop will introduce people to the site, which anyone can go on to use and share with anyone, and give people opportunity to generate courses to go live on the site and be part of a growing resource from teachers/ learners/ anyone.